At the rear of Thundersley Congregational Church, now hidden from view by the newer church, still stands the old Memorial Hall, built in 1930 by the local firm of C.S. Wiggins. “Stan” Wiggins would have been awarded the contract on the basis that, although his was only a small firm at that time, he was hugely respected in the church community. 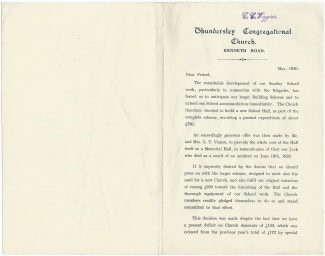 His family were members of the Peculiar People denomination and strictly observed the principle “no work on a Sunday”. 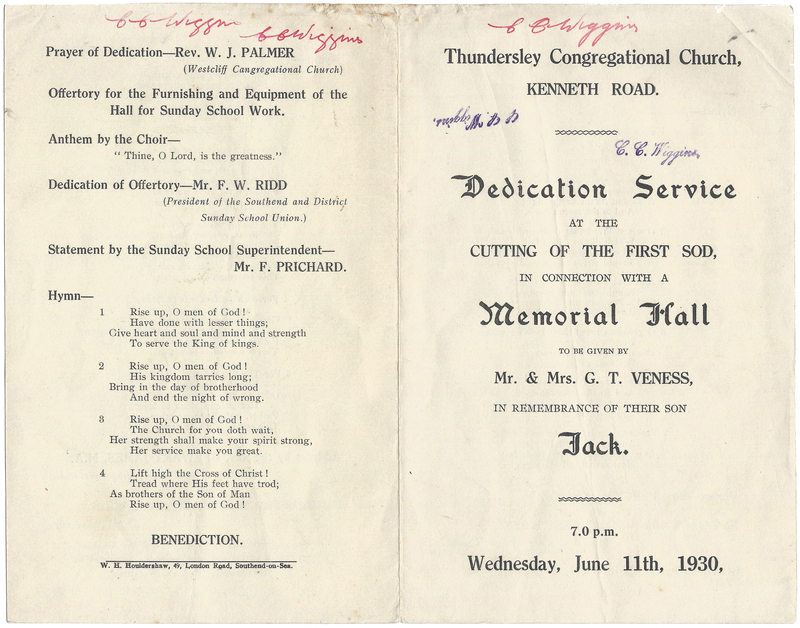 The 8-page order of service printed by Houldershaws for the special turf-cutting ceremony which took place on Wednesday evening, June 11th 1930, is stamped and signed C. C. Wiggins (Cyril Claude), the older son of Claude Stanley; he would have been about twenty years of age and would certainly have worked on the new hall as a carpenter joiner. It was to be another five years before Cyril and his brother Joe were taken into partnership. 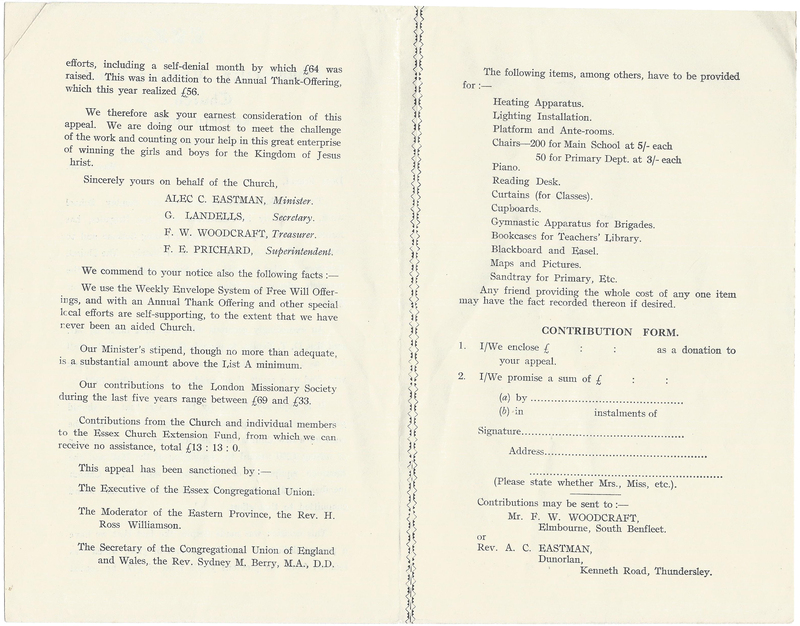 The remarkable development of our Sunday School work, particularly in connection with the Brigades, has forced us to anticipate our larger Building Scheme and to extend our School accommodation immediately. 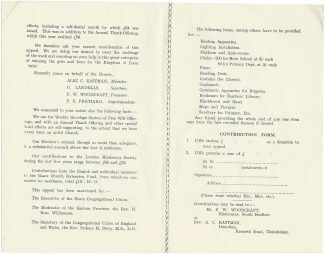 The Church therefore decided to build a new School Hall, as part of the complete scheme, involving a present expenditure of about £750. 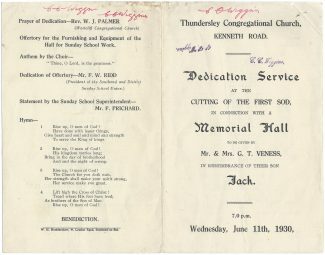 An exceedingly generous offer was then made by Mr. and Mrs. G. T. Veness, to provide the whole cost of the Hall itself as a Memorial Hall, in remembrance of their son Jack who died as a result of an accident on June 19th, 1923. 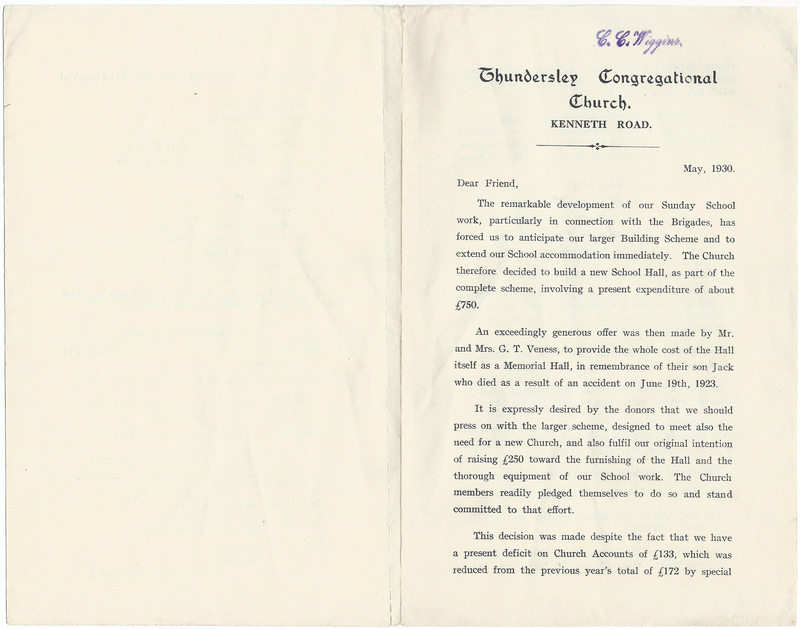 It is expressly desired by the donors that we should press on with the larger scheme, designed to meet also the need for a new Church, and also fulfil our original intention of raising £250 towards the furnishing of the Hall and the thorough equipment of our School work. The Church members readily pledged themselves to do so and stand committed to that effort. This decision was made despite the fact that we have a present deficit on Church Accounts of £133, which was reduced from the previous year’s total of £172 by special efforts, including a self-denial month by which £64 was raised. 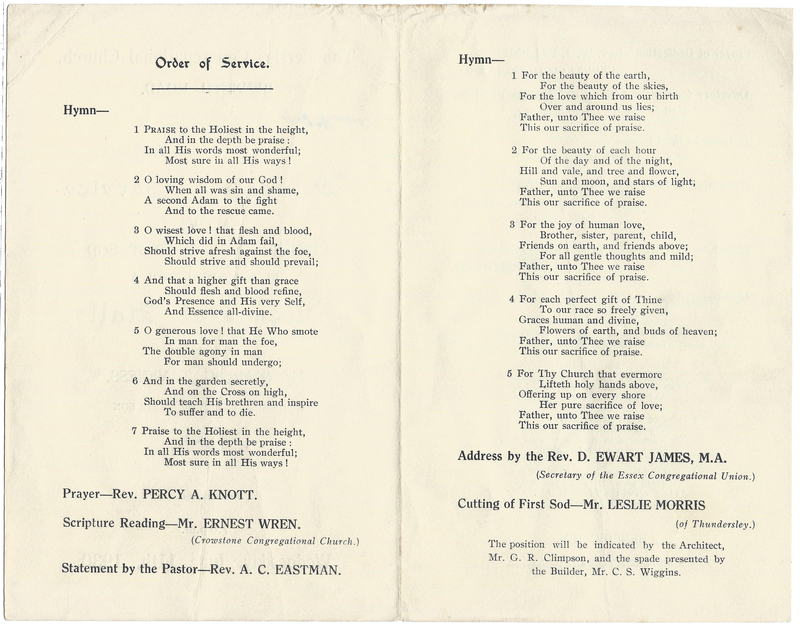 This was in addition to the Annual Thank-Offering, which this year realized £56. We therefore ask your earnest consideration of this appeal. We are doing the utmost to meet the challenge of the work and counting on your help in this great enterprise of winning the girls and boys for the Kingdom of Jesus Christ. The illustrations will open in a larger view if you click on them. 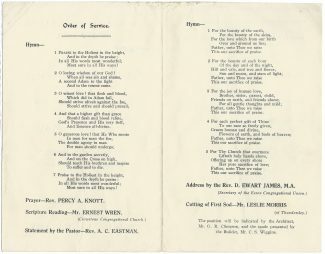 Special thanks to Mrs. Gwyneth Craze, daughter of Cyril Wiggins, for supplying the Order of Service. An excellent insight into Thundersley’s past. And the Kenneth Road Congregational Church is still expanding.